Fuerteventura is the jewel of the Canary Islands crown. It is the second largest island in the Canaries, after Tenerife and still remains fairly unspoilt and tranquil, although its popularity is growing every year. The island has a very relaxed and bohemian atmosphere. Its paradisiacal beaches attract surfers and other wave-catchers from all over the world. The island is also home to some of the best beaches in Europe and therefore, it is the perfect holiday destination for a true beach lover. Located in the easternmost of the Canary Islands and closest to the coast of Africa. It is often affected by the strong winds of the Sahara, which have supposedly helped to carry sand to the beaches here, straight from Africa´s biggest desert. Whether this is true or not, the sand dunes of Fuerteventura are a major tourist attraction on the island. Boasting a mild temperature all year round, Fuerteventura is one of the Canary Islands popular golfing destinations in Europe. 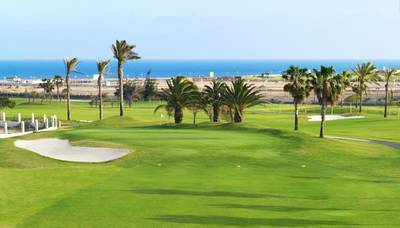 Fuerteventura provide a safe haven for golfers looking to escape miserable British weather in favour of some guaranteed short haul sunshine. 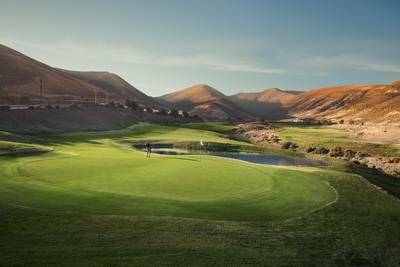 The weather in the Fuerteventura is ideal for golf with temperatures ranging between 18-25 degrees, ensuring all year-round playability, making a golf holiday to this destination a perfect option. With so much to offer, it comes as no surprise that so many golfers from Northern Europe head down to Furteventura and the other Canary Islands for a golf holiday at the first sign of winter. 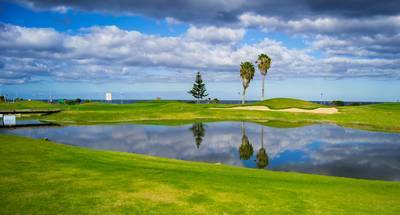 Book your golf tee times for Fuerteventura with Justteetimes.com, your one stop source for online golf tee times and green fees anywhere.